CHICAGO — The redesigned 2020 Subaru Legacy, in line with the brand's recent makeovers, keeps exterior styling similar to that of the outgoing version. The most significant changes to the midsize sedan, shown last week at the Chicago Auto Show, are under the hood and inside the cabin. Subaru of America CEO Tom Doll touted the improvements as making the Legacy "the safest, quietest, most spacious, comfortable, advanced and best-driving model we've ever produced." With the redesign, the Legacy moves to the Subaru Global Platform, following the Forester, Ascent, Crosstrek and Impreza. The redesigned Legacy is to arrive at dealerships this fall. Pricing was not announced. An updated 2.5-liter boxer engine that debuted in the redesigned 2019 Forester is standard in the Legacy's base, Premium, Sport and Limited trims. It generates 182 hp and 176 pound-feet of torque, up from 175 hp and 174 pound-feet of torque in the outgoing base engine. A turbocharged engine will return to the Legacy for the first time since 2012, the automaker said. XT models, either in Limited or Touring trim, get a 2.4-liter turbocharged boxer engine that makes 260 hp and 277 pound-feet of torque. With the turbocharged engine, which debuted in the 2019 Ascent, Subaru estimates the Legacy can go from 0 to 60 mph in 6.1 seconds. All Legacys will retain a continuously variable transmission and all-wheel drive. Subaru is dropping the Legacy's 3.6R Limited trim and its 3.6-liter six-cylinder boxer engine. Except for the base model, all Legacys receive a new 11.6-inch touch-screen infotainment system, a major change for Subaru. The automaker says it still will have a knob for audio volume. Base models come with a standard 7-inch touch-screen infotainment system. The Touring trim gets a standard navigation system with a split-screen display that is optional on Premium, Sport and Limited trims. Wi-Fi connectivity is now an option, a first for the Legacy. 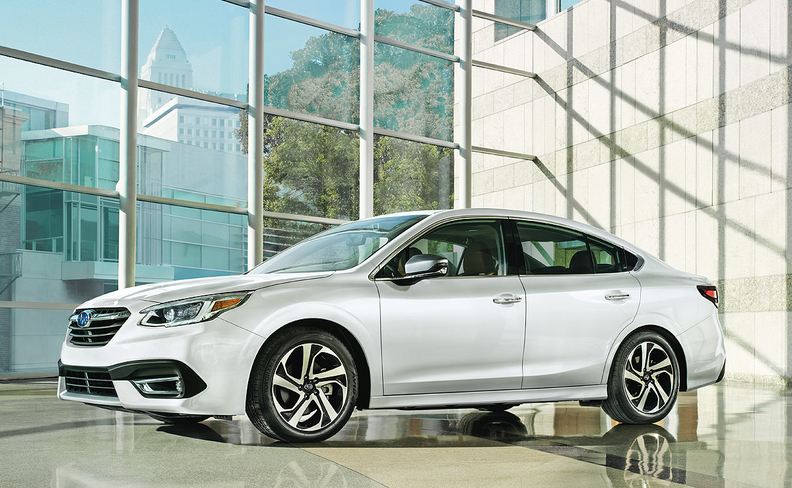 The 2020 model will continue to be built in Lafayette, Ind., alongside the Outback, Impreza and Ascent.